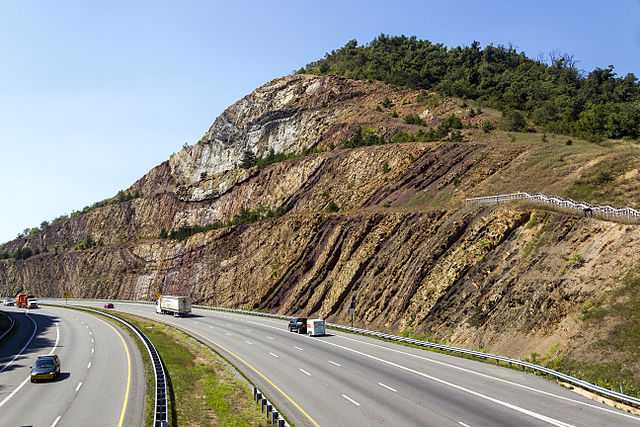 The Sideling Hill cut is approximately 340 feet deep, and is considered by many to be the best geologic exposure in the Northeastern United States, exposing multi colored layers of strata in a tightly folded syncline. See this .pdf factsheet from the Maryland Department of Natural Resources for some amazing aerial photography of the cut, as well as some interesting facts about it’s construction. As we briefly mentioned in the Rt. 40 Town Hill Overlook post, there are rest areas for both Eastbound and Westbound travelers on I-68, and they are connected by a pedestrian bridge. 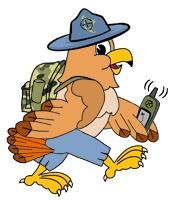 We at OCNA currently have no caches listed on our site at the cut (that could very well change before or during GW), but we have noted you can find 7 Geocaching.com listed caches there; 2 Earthcaches, 1 virtual, and 4 traditionals. There was a exhibit center on the Westbound side that opened in 1991, but it has been closed permanently by The State of Maryland due to lack of funding since 2009. However, most of the exhibits have been moved to the Hancock visitors center in downtown Hancock, Maryland, about 6 miles away. There is an indoor Geocaching.com listed cache there. Here you see an oblique view of the Mountain known as Sideling Hill, with the I-68 cut approximately center. 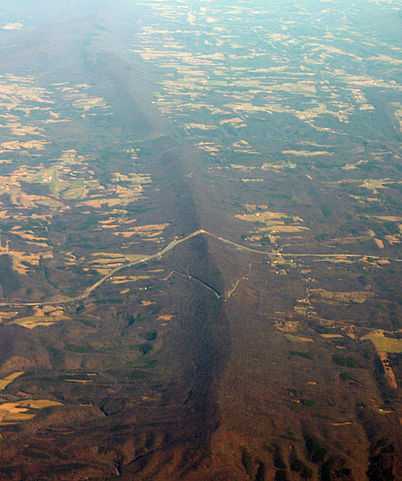 This Mountain ridge is about 50 miles long, running from near Slanesville, West Virginia to the Juniata River near Mill Creek, Pa. It is also famous for being bypassed by the Sideling Hill Tunnel along the original route of the Pennsylvania Turnpike. The 1.3 mile long tunnel is now part of the abandoned Pa. Turnpike, owned by the Southern Alleghenies Conservancy, and can be visited, although it’s at your own risk. There are plenty of Geocaching.com caches in/near the Sideling Hill tunnel and along the abandoned Pa. Turnpike, and you can use this one as a reference point. We at the OCNA blog are working our way closer to Boonsboro; note that the Sideling Hill cut is about 35 miles from the site of GeoWoodstock XIII. In our next GW related post (which may not necessarily be the next post to this blog), we will move a little closer to GW. But not by much.